A stubble trimmer is the best grooming accessory for men who prefer to keep their facial hair neat and short. But with all the brands that claim to offer the best stubble shavers on the market, which one should you choose? Well, a good place to start is BaByliss for men. This brand has a reputation for manufacturing top-notch electric shavers designed for different uses. If a stubble trimmer is what you need, then check out this BaByliss for Men Super Stubble review. You can unhinge the guide comb to define the edges of your stubble. The best part about this stubble shaver is that its blades are built to last. They feature a unique electro chemical sharpening technology that increases durability and cutting efficiency. The BaByliss for men Super Stubble comes with several features that make shaving and maintaining short stubbles a hassle-free experience. First off, the trimmer features a curved body that’s easy to grip. The trimmer’s pivot design also has contour heads that track the curves on your face as you shave, which further increases comfort and control. Setting this stubble trimmer is also very simple. Thanks to the motorized length control, you can adjust stubble length at the push of a button. The LCD screen on the trimmer shows you the chosen length setting and battery status. In case the battery dies in the middle of a trimming session, you won’t have to reset it after plugging in to a wall socket since your settings will remain saved in memory. When it comes to cleaning, the waterproof construction of this stubble shaver will prove to be a handy feature. It allows you to rinse your guide comb under a tap to so that running water can wash away those hard to reach hair clippings. A cleaning brush comes with the package as well, allowing you to dust off excess hair from the guide comb before rinsing. With the BaByliss for Men Super Stubble, you don’t need to plug in your shaver to a wall outlet in order to tame a scruffy beard. The shaver uses a Lithium-ion battery that offers up to 60 minutes of cordless use on a full charge. It takes up to 1.5 hours to charge the battery completely, but the 5-minute quick charge feature can buy you just about enough time for a single stubble shave. 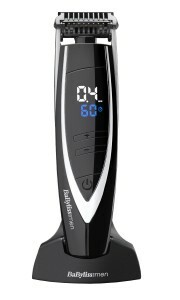 The BaByliss for men Super Stubble has many good reviews from buyers at different websites. For example, at the time of this writing, the shaver has a 4 out of 5 stars rating at Amazon after 140+ reviews. The majority of buyers seem to be satisfied with this product while only a handful have had a bad experience. If you’re in the market for a quality yet low priced stubble trimmer, the Super Stubble from BaByliss for men is one of the choices worth considering. It’s a convenient, low maintenance stubble shaver with plenty of features. Overall, this trimmer has few flaws and offers good value for the price.